The results are in for our second annual Learning and Remembering Survey. We surveyed learning professionals throughout 2015 to find out what their top training priorities are… and what challenges they face. The survey has only two open-ended questions: “What do your learners need to remember to be successful in their jobs?” and “What challenges do you face when delivering training that helps learners remember this knowledge?” It aims to cut through the clutter and find out what organizational knowledge is really crucial for employees to learn to be successful – and what makes it hard to enable them to be successful. 50 organizations participated in this year’s survey, up from 34 in the 2014 edition. 16+ industries were represented, with no single industry dominating the results. 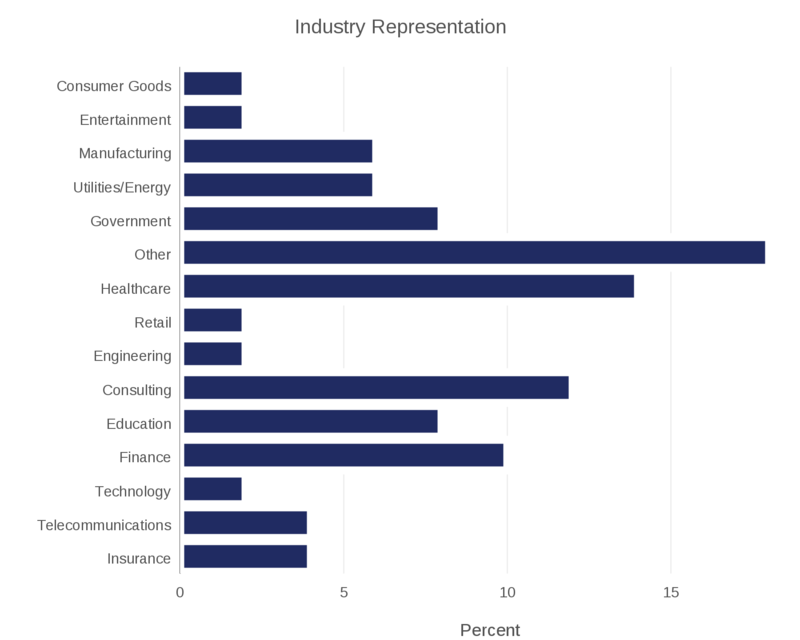 Healthcare (14%) was the most a single industry was represented. What do employees need to remember? The first question of our survey asked: What knowledge do your employees need to remember to be successful in their jobs? 88% of responses centered on some form of fact-based knowledge or “hard skill” that needs to be learned. This was an increase over 77% in the 2015 survey. The need to understand customers, competitors and the marketplace as a whole was mentioned more often than in the previous survey. The other 12% of responses focused on a collection of soft skills or where to find and locate information. What makes it hard for employees to remember? We also asked: What challenges do you face when delivering training that helps employees remember this knowledge? Just like in the 2014 survey, this question was not meant to uncover all the challenges that an organization faces when delivering training. It is a useful measure of what challenge comes to mind first or feels the most pressing. Responses to this question were much more varied than in 2014. Knowledge transfer and retention issues led the responses with 28%, but other issues such as motivation and engagement (22%) and internal organizational issues (16%) also had many responses. Having too much content to train on (6%) and too little time to do it (14%) were also significant factors. No matter what new trends the training industry is chasing, experience (and survey results) tell us that the central challenges organizations face are not drastically changing year after year. Getting employees to perform the right behaviors, build necessary skills and acquire crucial knowledge is just as challenging as it has always been… if not more challenging. Survey respondents put an even greater focus on all of the hard knowledge and skills that employees must know “cold” in this year’s survey compared to 2014. It is also notable how many organizations cited an organizational issue that is not related to the design of the training itself. Training can only fix so many things, which is why the analysis phase is so important. Throughout the year, we will share best practices, tips and case studies to help you discover the best ways to both engage your learners and ensure that they retain critical knowledge and skills. It’s what we do! So you need your employees to remember information? Learn all about remembering and strategies for long-term retention with Sharon Boller’s white paper When Remembering Really Matters. Your website is really nice and so many great articles in here . .
Can you tell us the # of people that were surveyed? thanks!